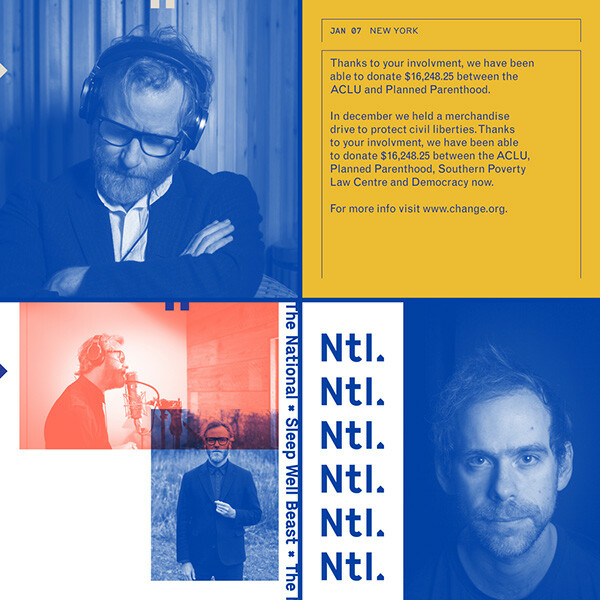 When The National began to work on their seventh studio album, Sleep Well Beast, they enlisted their friends to create a community-based work of art. Among the tight-knit group of artists were Luke Hayman of Pentagram, photographer Graham Macindoe and visual artist Casey Reas. We were invited by the band to collaborate with Luke and his team on the design of the band’s website–and to also design and animate a collection of social media posts. Pentagram worked with the band to create a visual language for the album that riffs on traditional corporate branding–which spans across the album packaging and all promotional materials. The website we developed also follows these guidelines, and presents the album, news, tour dates, and videos in an organized and thoughtful way. The website homepage features a time-lapse video of the bands recording studio, while they rehearse for the day. In addition to the site, we also designed and animated the bands social media presence. The posts include a series of cryptic teasers that were used to build suspense for the upcoming album, and were endlessly deciphered by fans. 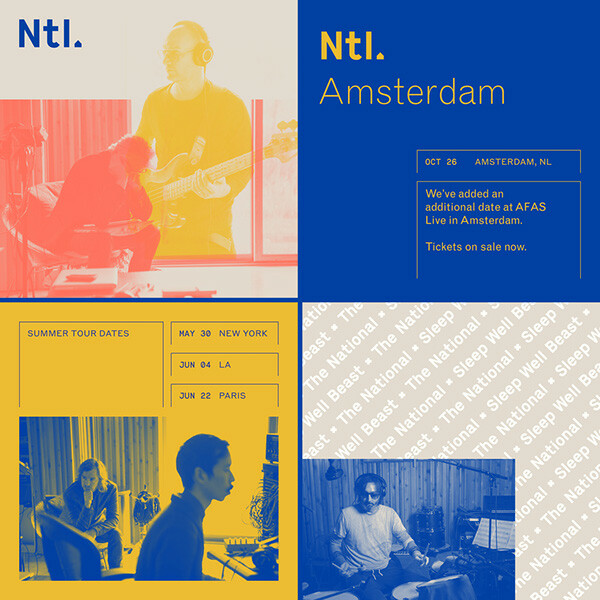 When The National began to work on their seventh studio album, Sleep Well Beast, they enlisted their friends to create a community-based work of art. Among the tight-knit group of artists were Luke Hayman of Pentagram, photographer Graham Macindoe and visual artist Casey Reas. We were invited by the band to collaborate with Luke and his team on the design of the band’s website–and to also design and animate a collection of social media posts. Pentagram worked with the band to create a visual language for the album that riffs on traditional corporate branding–which spans across the album packaging and all promotional materials. The website we developed also follows these guidelines, and presents the album, news, tour dates, and videos in an organized and thoughtful way. 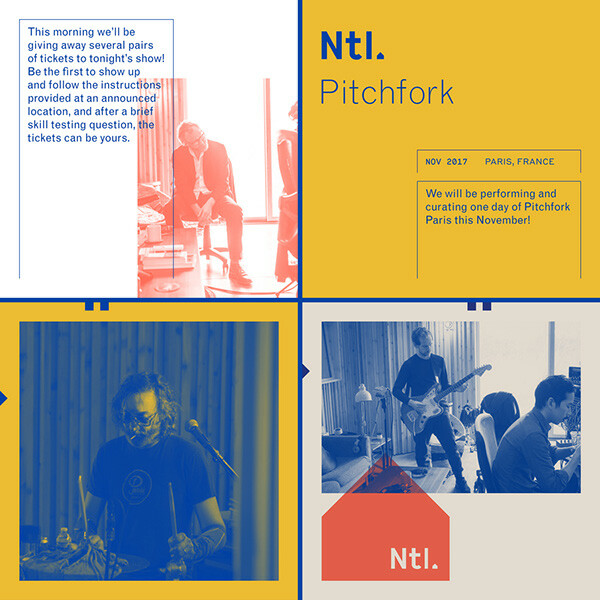 The website homepage features a time-lapse video of the bands recording studio, while they rehearse for the day. In addition to the site, we also designed and animated the bands social media presence. The posts include a series of cryptic teasers that were used to build suspense for the upcoming album, and were endlessly deciphered by fans.